When it comes to speaking at public engagements, presenting behind a lectern is the best way to command attention. But this, by no means, is limited to indoor press rooms or auditoriums. Outdoor podiums transport official presentations out into the sunshine! In order to weather the elements, rain or shine, these pulpits need to be tough. 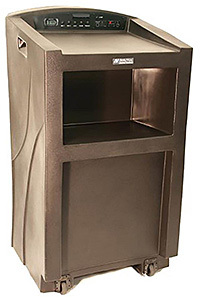 Our outdoor podiums can handle whatever mother nature dishes out thanks to their hard plastic construction. Semi-hollow yet lightweight, they offer easy mobility for temporary engagements. 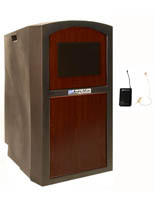 This line of outdoor podiums is manufactured by Amplivox® in two faux-wood finishes with a nice variety of sound system options. 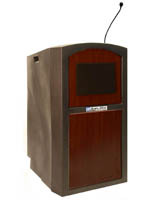 How can mobile lecterns enhance your exterior presentation? 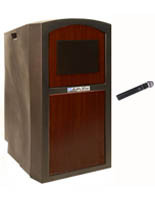 Outdoor podiums almost always need to be amplified. Unlike quiet interior spaces, exteriors come with much more ambient noise that can affect the speaker's ability to project. Integrated control panel features a stereo amplifier, volume controls, UHF receiver, and Bluetooth® module — all waterproof. Front-mounted speakers, with two additional exterior speaker jacks. The wired microphone option is mounted to the top and can pick up your voice up to 20" away. 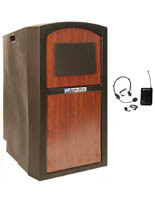 Wireless options include a handheld mic, lapel mic, or over-the-ear headset. 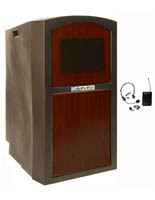 Two heavy-duty casters are mounted on the speaker's side. 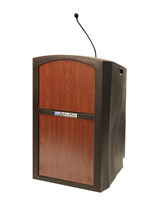 To move the lectern, simply tilt the stand back and roll as needed. 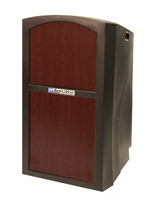 The podiums are molded using a hard-shell plastic that is weatherproof. Decorative design flourishes are visible on each side. 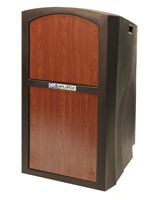 Two faux-wood plastic laminate finishes are available: Cherry or Mahogany. Performing ceremonies in the great outdoors is a necessity for many organizations. Many universities and colleges observe graduations outside. Building dedications, ribbon-cuttings, even political rallies are all outdoor functions that use lecterns for the special occasion. With portable capabilities, it makes setting up for a temporary commemoration that much easier. In addition, the fact that these models include sound systems means the spokesperson's voice will be heard above all other distracting noise. 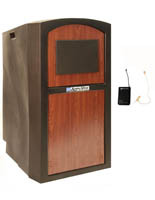 Pulpits with amplification featuring microphones are also available in interior-only models with a nice assortment of wood finishes.